Are Things at BPL Worse Than Imagined? On Tuesday the New York Daily News reported that the Brooklyn Public Library’s Central Library, located at Grand Army Plaza, is in desperate need of repairs. According to reporters Marco Poggio and Reuven Blau, BPL’s majestic headquarters— the most heavily used library in Brooklyn—is falling apart. Current estimates are that $100 million dollars in repairs are needed so that the Central Library can continue serving approximately one million patrons annually. This new amount greatly exceeds a $67 million dollar estimate from 2013. According to the Daily News, among the Central Library’s most pressing repairs are: a wrecked roof, cracked windows, creaky elevators, faulty air conditioning and absolutely disgusting bathrooms. This must sound all too familiar to users of the Brooklyn Heights Library branch, which is now open from 8am to 1pm Monday through Friday and 9am to 1pm Saturday due to broken air conditioning (with no repair in sight). One wonders which of the two buildings’ bathrooms are worse: the ones at the Central Library, where, as the News reported, “the smell in there can sometimes kill you,” or those in Brooklyn Heights where stinky patrons take up residence and may actually try and kill you. In case anyone is missing it, these enormous repair bills are why BPL is looking to sell the Brooklyn Heights library building. In a bold proposal that will put a 40-plus story residential tower—and a new 20,000 square foot library branch with clean bathrooms—on the Cadman Plaza branch’s triangular plot, BPL leadership hopes the sale will generate desperately needed capital funds to repair multiple branches throughout Brooklyn. The reality is that it will take more than a single—albeit blockbuster—real estate deal in Brooklyn Heights to stem decades of infrastructure decay at BPL’s branches. Missing from the BPL’s capital funding equation is support from the very politicians who look to the Library to provide necessary social services that have been gradually shrinking over the previous 12 years. I think the overriding consensus at the Brooklyn Borough President’s first task force meeting on libraries is that you can’t trust BPL officials or what they want to tell you while they are engaged in real estate shell games. A lot of money has been spent quite recently making changes Grand Army Plaza. Is the notion that this money wasn’t being spent on priorities? How much of these projected costs are for changes they want to make to get rid of books and materials like sheet music as they shuffle to shrink the Brooklyn Height Library? Remember that the NYPL was hiding the fact that space-shuffle renovations involved in selling Mid-Manhttan and the Science, Industry and Business Library were going to cost $500 million. 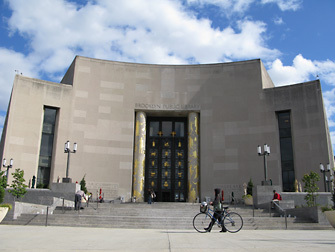 And now the NYPL still wants to sell SIBL which, because it was so recently completed, is in superior physical shape! Anyone have any idea what is going on at the Brooklyn Bridge right now? Cadman Plaza West is stacked with fire trucks and police vehicles. Actually just read on Twitter that a wall under the bridge collapsed during the storm?? Wow! So the public should not trust the library but instead trust you? Why? As an unemployed urban planner do you have some sort of special knowledge of public library operations? You’re entire campaign is based on unsubstantiated hogwash. You report rumors and fantastical conspiracy theories as if they’re facts in order to scare people. You should be ashamed of yourself. When I was saying the Central Library Plan was likely to cost a half billion dollars and such was being denied by library officials and those in charge of delivering capital funds to the libraries who turned out to be correct? I suppose your comment is an attempt (an off-target one) at an ad hominem argument, but yes I do have special knowledge of government and finance and the way that public institutions operate, maybe one reason I got the call right on the Central Library Plan. How much are they sending to Canadian company that runs new web services and took over the online catalog?